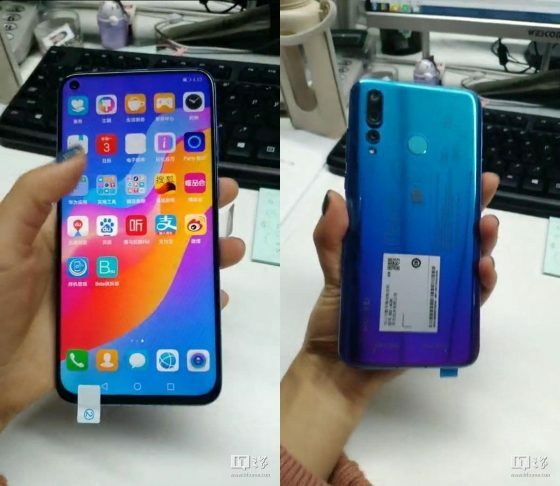 Huawei Nova 4 is a smartphone whose premiere will take place exactly on December 17th . A partial technical specification has already been disclosed on the TENAA website , but it was not very specific. Now we get to know more details due to the leak at Weibo. There, a lot of information about the equipment of the phone was published. Huawei Nova 4 has a 6.4-inch screen with a hole with Full HD + resolution. Then we have the HiSilicon Kirin 970 processor, which will be supported by 8 GB of RAM. 128 GB of built-in flash memory was allocated to the data. The battery will be delivered with a capacity of 3750 mAh. On the Huawei Nova 4 there is also a 25MP frontal camera for selfies. A triple camera is placed on the back of the casing. It consists of sensors 48, 16 and 2 megapixels. The fingerprint reader is on your back. The price is still not known. 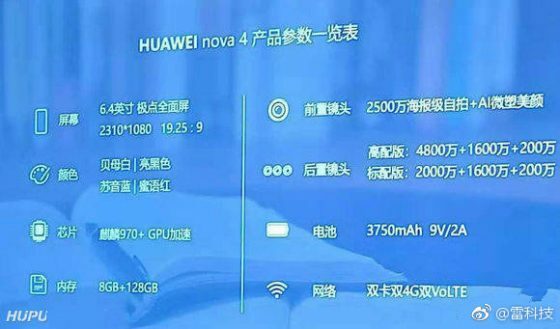 Known technical data of the Huawei Nova 4 model can be found below.